I first heard about Karuizawa as an English teacher living in Saitama, twenty years ago. It was the place to go to escape the summer heat in Tokyo - cool in both senses of the word, beloved by the rich and famous. Needless to say I never went. Until this year. It was indeed lovely, the mountain air was noticeably fresher and cooler, and it felt rather different to the rest of Japan. John Lennon used to go there, apparently. Hot springs, shopping and cafes are the order of the day. I’d found a place on Instagram that looked fun, and although the food wasn’t quite what I was hoping for, the dappled shade vibe of the cafe itself was amazing, and made me want to chop holes in all our tables back home at once. 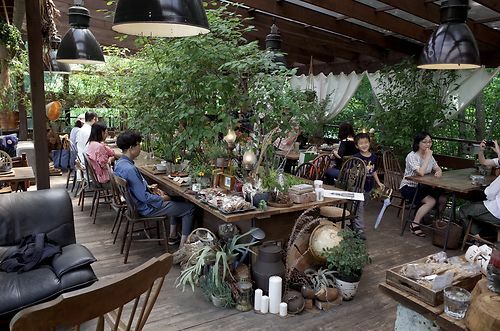 It had a very contemporary feel to it, what’s called natural gardening in Japan, very on-trend, with multi-stemmed deciduous trees carefully thinned to create that delicate woodland feel, creating a subtle balance between people and nature.